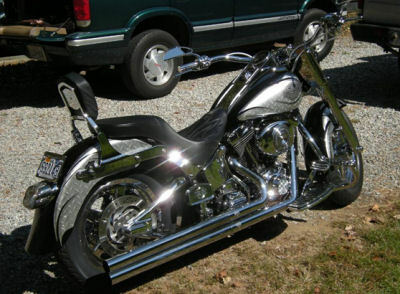 The 2002 CUSTOM FATBOY for SALE has Chrome Harley Davidson wheels, Vance and Hines long shot exhaust, chrome front forks, Nacelle headlight kit, Harley beach bars, custom crash bar, all the cables are braided, power commander, c & c motorcycle seat and tons more custom parts. The motorcycle rides great, has never had any problems and is awesome condition plus it's got a new battery! This is a MUST SEE by that is a real head turner! The super clean bike has never been wrecked and has no damage. You just don't find a used Harley Davidson for sale as fine as this one every day that has only 13k miles on it, loaded with chrome and a custom diamond paint job that must be seen to be believed. The motorcycle is located in Virginia and my asking price is a very cheap $14,999.00. I will only accept a cash sale and you will receive a clean title. I will only do business in person and I'm not willing to consider trades. If you're interested you can reach me by sending me an e-mail using the form on this page to leave your questions and contact information in the space below provided by Strike Lightning Used Motorcycles for Sale and I will respond with answers to your questions or after consideration of your offer as soon as possible. 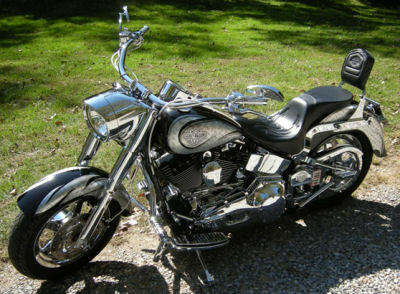 Strike Lightning would also encourage bikers to submit a review of the 2002 CUSTOM FATBOY for SALE to help potential buyers make informed decisions and to benefit the biker community as a whole.